Mayday, Mayday, Earth's Calling! - Life's Never Boring Beibi! Today is my weakest point. Physically, yes. My low blood-pressure just came, and even I could not go into office. =( Rendy took care of me and now I could sit without feeling too dizzy. I take it as my natural alarm, after 2 weeks in a rush. I hope tomorrow I could start doing things in office, because this week will be a busy week for IOP-UA. I want too boost my own mood by posting my outfit in Ied day. My sister's camera degrade the color of my skirt into turqoise, which is my blog color. Hehe. It is actually tosca. 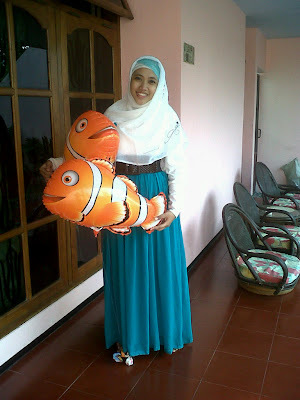 Abhi & Deva's Nemo balloon just make it perfect with the color. Voila!